You and I, in this beautiful world. Green grass, blue sky. You and I.
Siblings are perhaps the closest to us than any one else. We grow up together, we know each other well and there is this understanding that is really hard to find elsewhere. Also, we belong to the same generation and loyalty is very strong. Given the importance of this relation, there are quite a few occassions when this relation is celebrated, especially by the Hindus. One such day is the last day of the Tihar festival which celebrates the life-long relation between brothers and sisters, called the Bhai Tika. This is truely a beautiful day and a very apt way to celebrate this bond. On this day the sisters perform a special puja for their brothers for their long lives and prosperity and the brothers give them gifts as a way of appreciating their love. This picture exemplifies this bond. 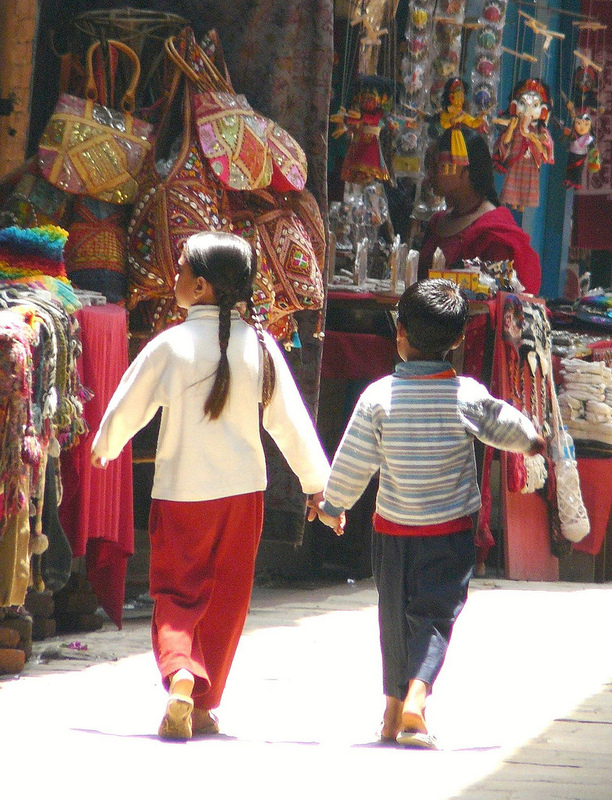 These brother and sister look really adorable walking through the market. This was taken at Bhaktapur, Nepal. You can see them happily walking hand-on-hand. May be the little brother is saying to his sister that he will gift her those beautiful bags when he grows up.